“I find it weird to be discriminated against for being Asian, while I’m in Asia,” Lee said. Recently, Mike Lee got rejected when he applied to be an English instructor in China while Will Evans, a Canadian, got this job. The only reason for Lee’s job rejection turned out to be Lee looks too Asian. It is not a secret that recruiters in China evaluate candidates for English instructors only based on their skin color. They don’t care about your English fluency or academic credentials as long as you are white enough because Asian parents believe white people can speak better English. Still can’t find a job in America? Being white can definitely get you a job in China. This news reveals a fact that white privilege and racism are alive outside the U.S., even in Asia. Western countries are struggling to become a “post racial society.” In Asian countries, however, being white is definitely a plus to finding a job, renting a house or getting an Asian girl. White people enjoy all the privileges of being white even though they are far away from their home. Asian Americans, however, don’t have such privileges because of their skin color in spite of their self-identity as Americans. In Asian countries, Asian people simply divide people into three racial categories based on skin color, the black, the white, and the yellow. Among the three racial categories, whiteness is preferred. The whiter your skin is, the better people feel about you. Some Chinese companies even have “Rent a White Guy” business to have foreigners, white foreigners, be fake businessmen. Pretending to have a white employee gives the company face. Compared to white people who have a lot of privileges in Asia, Asian Americans and other races survive in social cracks. On one hand, racial boundaries hinder the ability of Asian Americans and other races to succeed in America. On the other hand, when they escape and look for another possibility outside U.S. territory, ruthless reality destroys their fantasy. Though it is hard to believe, Asians have a little hostility toward Asian Americans. Asian Americans are scorned for deserting their motherland in spite of the same heritage they share. The strong reaction to Ambassador Gary Locke nomination several years ago is a good example. It reveals a thicket of conflicting feelings about race, national identity and patriotism according to LA Times. A netizen called Mr. Locke “A fake foreign devil who can not even speak Chinese” on discussion board. When Asian Americans struggle to embrace another identity in Asia and strive to get accepted by Asian societies as truly Asians, white people reap without sowing for being white. Asia is believed to be a land free of racism because Asian people seem to talk less about race. However, there is no such utopia where every race and gender can be treated fairly. These examples of white privilege and racism in Asia prove racism also exists there even though many Asian people believe that racism only exists in western countries. Many Asian people never think their behavior such as favoring white people can be racism. They assume themselves to be innocent. It is necessary for Asian people to be aware of the fact that their careless behavior can also result in racism and changes to their behavior. This entry was posted in Blog posts and tagged Asia, Asian American, post-racial, racism, White Privilege on December 10, 2013 by Leilani Nishime. 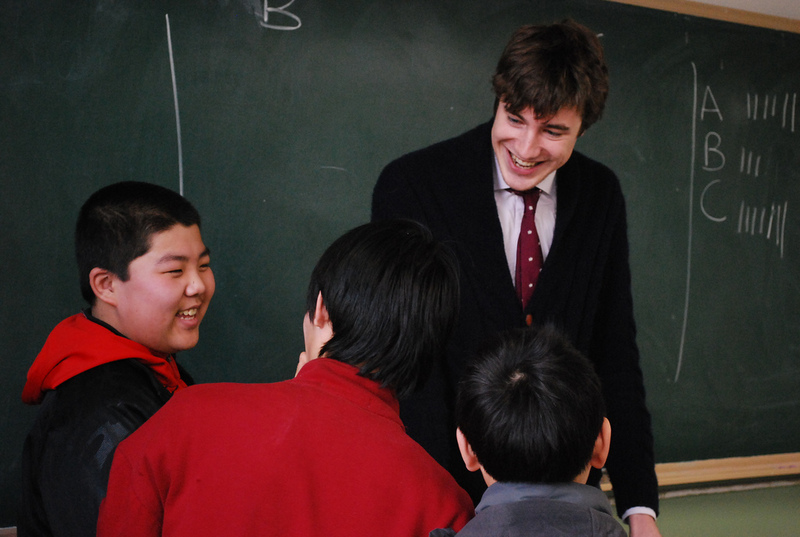 In Korea, academic institutions also tend to hire the English teacher, who is white. Especially, the institutions which put their upmost value in English conversation, believe that hiring White rather than Asian American, who has same skin color as us, provide more trust and faith to children and their parents. When I was in Korea, I also considered that English class, which white American teacher taught rather than Asian teacher, who was fluent in speaking English, is a real English class. Accordingly, it seems that Asians tend to admire white people and so White privilege are quite pervasive in Asian countries. While reading this blog post, I was shocked that I was also a person who believes that Asia is a land free of racism because Asian people seem to talk less about race. However, after reading blog post, I strongly felt that our carless behavior such as giving white privilege even in our home country is also a strong form of racism in this world. Coming from another Asian country, I can really relate with what you have written. In Indonesia, Caucasian people are paid a higher salary compared to locals regardless their ability to teach. I remember I had a Biology teacher who did not know what he was teaching and was so all over the place, however, my school kept him for quite a while until a majority of students failed Biology as a subject. Only after 4 years did it take the school to fire him. It seemed like Caucasian “teachers” are being so highly demanded in Asia, due to the belief that they are more “superior” and we would benefit from the education that they can offer. It is sad, sometimes to think how unfair the local teachers are being treated. Schools give these foreign teachers a better living standard and added bonus to their contracts. I’ve actually worked at one of the academic institutions as one of the recruiting managers and I couldn’t agree more with your post. Korea is a highly segregated, homogeneous country in terms of race, so competition is very high in getting a job (since it’s the same people who speak the same language fighting over one job). But often times, regardless of how many languages this Korean person speaks, or how much job experience he/she has had, academic institutions will prefer or favor a native speaker of English or any other foreign languages with the exception of other Asian languages. It’s the same thing with tutoring. My parents always hired an American or Canadian tutor instead of Korean-Americans and it wasn’t that the Korean-Americans who came over to my house for an interview couldn’t speak English fluently. Because I came from China, I can totally understand what you want to express here. It is the truth that there is discrimination in Asian countries, especially in China. When I was in high school, we had some foreign English teachers who came from either the U.S. or the U.K. The common point is that all of them are white people. It is obvious that white people have the privilege for the job in Asia. They enjoy different kinds of privileges of being white even though they are far away from their home. I don’t understand why white people have the privilege all the time wherever they are. It is unfair for other people. This is a very interesting thing to blog about! I never knew that Americans get chosen over Asian people just because they believe that Americans are better. I think that is very unfair and it shouldn’t be that way. Jobs should never discriminate against skin color or ethnicity. I feel as if that is just such an irrelevant factor. Although it is a positive for Americans who cannot find a job in America, I still think it is very unfair. This reminds me a lot of how I know many people at the UW refuse to take quiz sections with TAs that do not have American names because they fear that they’ll be stuck with a TA who can barely speak English, therefore leading them to suffer in the course because they will have difficulties understanding what is going on. I never knew that there was so much racism against Asians in Asia. I always had assumed that there would be more representation of Asians over there, and I think that it is interesting that in some places that they would prefer a white teacher over an Asian teacher. I thought that white privilege was a larger problem in America, but unfortunately it seems to be spreading into Asia. I can’t believe you can rent a white guy! I wonder how much it costs! It is funny because I doubt many companies would rent people of color to give the company a better image. Love the topic and discussion!